It is 1805 and Russia and France are about to go to war. In the Rostov household, they are concerned about three things; money, marrying off their children and war. The Bolkonskys’ estate is out on the countryside where the old Prince holds the rest of the family in a tight clutch. Pierre Bezukhov is the illegitimate son of one of the richest counts in Russia, and he unexpectedly inherits the money and climbs on the social ladder. He marries one of the important ladies, Helene Kuragina, but the marriage is colder than ice. Napoleon and his army destroy the Russians, and even the aristocracy suffers horrible losses. The war changed the lives of the noble families, and they lived through tragedies, but also had some happy moments during the war. 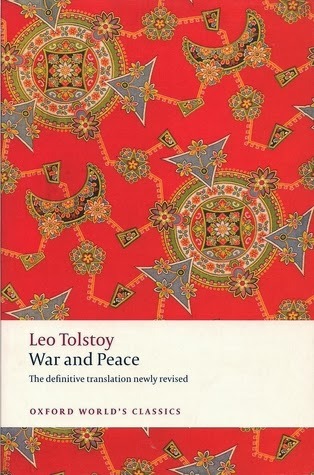 War and Peace is said to one of the best novels ever written. I cannot say that I agree, although I really enjoyed the story. But the bloody philosophical essays in between, and especially in the final epilogue. That really ruined the book for me. And Tolstoy sure takes his time to get to the point, and I believe that it would have been a lot better if only he had a strict editor. If you plan to read it, I suggest you go for a good edition which has put all the essays in an appendix. But luckily, Tolstoy’s genius shines through, and those parts which deals with family life, and especially love, are brilliant and as good as Anna Karenina. I just wish he would have kept to those subjects, as the strategies and details about warfare don’t interest me at all. I do, however, see why many men list this as their favourite book. I’m just glad that I can tell the world that I have read War and Peace. This was September’s read in Line’s 1001 books reading challenge (and yes, I needed another week to finish it). Anna Karenina is the unhappy wife of Karenin and the devoted mother to their son. But then she meets Count Vronsky who takes her by storm and she gives up her family and her place in society to be with him. The extended family of Anna are also important characters in this excellent 800+ pages long Russian classic. I fell in love on the first page and the love lasted until the last page. Or maybe not entirely until the last page, because all the religious doubt was too much. My favourite character must be Levin, a friend of Anna’s brother and the suitor of his wife’s sister. I can’t really pinpoint why, but he seemed like a sincere character all through the book. All the other intrigues in the extended family and their friends’ lives are all so excellently explained. The only thing I was really curious about was what Dolly’s daughter had been doing with the raspberries. It must be something naughty as it wasn’t in the book! I’m sure there’s so much to be said about this book, but the most important thing is that I loved it so much that it will be up there amongst my favourite books. I’m also excited about the new film version which comes out later this year. This was June’s book in Line’s 1001 books reading challenge, to see what other Norwegians say about it, go here.